Lat 6° 7' 60N Long 171° 55' 0E Mili Island is located at the southwest edge of Mili Atoll (Mille) in the Marshall Islands. Also known as "Mille Island". Borders the lagoon to the east. To the southeast is Arbar Island and Madagai Island to the north. Mili Atoll was considered part of the Caroline Islands. After World War I, administered as part of the South Pacific Mandate by Japan. Mili Island was small lookout post, radio direction finding station and weather station. During late 1942, the Japanese began developing an airfield on the island, using Korean and Marshallese labor force. At its height, the garrison included 5,100 Japanese including 2,600 Navy and 2,500 Army. The base lacked any large concrete structures, such as command buildings, power stations or bunkers. The island had one radar with a range of 50 miles, giving ten minutes warning for any enemy aircraft inbound. The perimeter of Milli Island, especially the ocean side, bristled with guns, which were a mixture of British and Japanese manufacture: 8 6" and 3 x 14cm coastal defense guns, 4 x 127mm dual purpose guns, 2 x 10cm mortars, 35 heavy and over 70 light anti-aircraft guns as well as an assortment of small arms. During Operation Galvanic in late November 1943 USS Plunger SS-179 performed lifeguard duty off Mili and rescue Lt(jg) F. G. Schwartz pilot F6F Hellcat 08939 ditched November 22, 1943 near Knox Island. By late 1943, supply lines to Mili were cut off, and the Japanese garrison was left to starve. 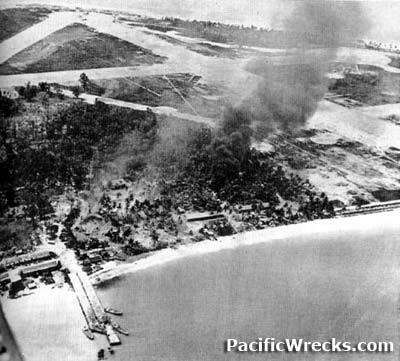 Over eighteen months, Mili was the target of US aircraft. The garrison of 5,100 Japanese (2,600 Navy and 2,500 Army,) only 2,500 (50%) survived. Casualties occurred from air raids, diseases, accidents, and suicides, but mainly from starvation. On August 22, 1945, the Japanese garrison on Mili was the first Pacific island to surrender, eleven days before the formal surrender of Japan. Built by the Japanese, still in use today for local air service.